Milan has a humid subtropical climate, whereas most of Italy has typical warm Mediterranean weather (cooler Alpine in the far north; hot and dry in the south). Winter in Milan is usually damp and cold with temperatures ranging from zero to 8ºC (especially during December and January), while in contrast the summers are warm and can be quite muggy and uncomfortable at times. Average temperatures in Bergamo are -4/+6ºC in January and +15/+28ºC in July. From March through April temperatures range from 6-18ºC and in October to November they range from 6-17º C.
Humidity in Milan is quite high during the whole year with annual precipitation averages of about 1000 mm. The hours of sunshine are the same as the Mediterranean average, but in autumn and winter the weather can be very foggy, which is a typical feature of the climate in the Po River valley. The average monthly rainfall in Milan can vary quite considerably during the year, with wettest season is definitely the autumn when it may rain for several days without a break. In late spring and summer the average rainfall level may increase because of unexpected storms. One of the best ways of exploring Milan and visiting unspoilt areas off the beaten track (which are not overrun by tourists) is car rental at Bergamo Airport. If you are in Italy during the hot and humid summer months then you should certainly consider hiring a vehicle with air conditioning (opening a window is no enough as it just lets in the hot air). 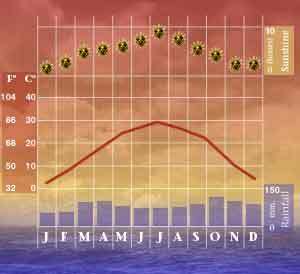 Below is a climate chart showing the weather in Milan on a monthly basis.